The Surface line up once stood alone as one of the only proven hybrid tablet-notebook devices on the market. And, for a while, no one took it that seriously. 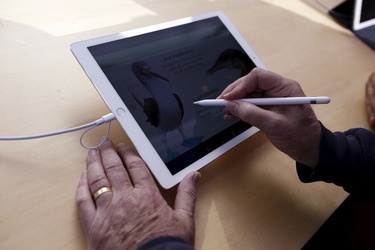 But as it grew in popularity, other companies followed suit, including Apple with its latest iPad Pro. Both devices are sleek and high-end, but when it comes to their biggest demographic - business users - which one takes first place? In terms of portability and design, it's really a tie between the Surface Pro 4 and iPad Pro. You can't go wrong with either device. Both sleek, stylish and lightweight. 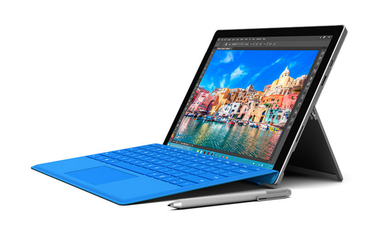 The Surface Pro 4 measures just .33-inches thick, while the iPad Pro is slightly thinner at .27-inches. 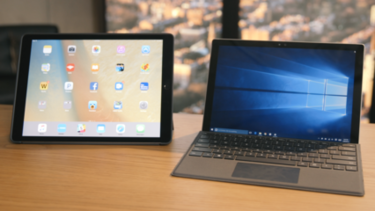 In terms of weight, the iPad Pro weighs in at 1.57 pounds, while the Surface Pro 4 is just slightly heavier at 1.69 pounds. But looking at the differences in size and weight is really a case of splitting hairs. Either device is going to offer a portable experience with a high-end premium finish. Much like the portability and design of these devices, you aren't going to miss out on much in the way of display if you opt for one over the other. The Surface Pro 4 has a 12.3-inch display, while the iPad Pro measures at 12.9-inches. Both offer a decent amount of real estate for using apps and snapping two apps or windows side by side. In terms of resolution, it's pretty much a draw, with the Surface Pro 4 boasting a slightly higher pixel density at 267 ppi, while the iPad Pro touts a 264 ppi. With either device, you will be treated to a crystal clear display that offers great color representation and a crisp viewing experience. As with past Apple devices, you can purchase a separate dongle that connects to the Lightning port to give you HDMI output or the capability to use a MicroSD card, but the options beyond that are limited. So if someone hands you a USB drive with important documents on it, you'll first need to upload those to a cloud storage service on another device that can read USB devices. And if you want to connect it to a non-Apple display, unless you have an Apple TV that can mirror the device to your TV, you'll need to deal with an HDMI converter hanging out of the charging port, hogging the lightning port. Both the Surface Pro 4 and iPad Pro have keyboards that you can purchase separately. Each keyboard supports the device and offers a similar experience to a traditional notebook. The one big difference between the two, however, is a trackpad. Apple's iPad Pro Smart Keyboard does not have a trackpad, and you can't use a mouse with the device. While it's one small difference, it might make or break it for some business users. If you find that you are more productive with a mouse, rather than just a touch screen, you'll want to go with the Surface Pro 4. Another thing to note is that both devices can also be used with a stylus. Apple has the Pencil, while Microsoft has the Surface Pen. You'll have to purchase the Apple Pencil separately, while the Surface Pen comes included with the device. The Surface Pro 4 definitely wins when it comes to peripherals, it not only allows you to connect multiple displays, but with the option of a mouse, you can easily transition between displays and apps flawlessly. With the iPad Pro, since you can't use a mouse, you'll be stuck turning to the device to tap on the display anytime you need to multitask or change apps. This one depends on what ecosystem you use at work - OS X or Windows. If you have a work-issued Mac and iPhone, an iPad Pro will seamlessly integrate into your working life. Your messages, apps and more will naturally sync between devices. You can even answer a call on your Mac or iPad if your iPhone is in range. Alternatively, even if you use Windows at work, there are a lot of Microsoft apps available in the iOS app store, including Word, PowerPoint, Outlook and Excel. However, with the iPad Pro, you're limited in the sense that it's a mobile operating system, rather than a full desktop operating system like OS X or Windows 10. When it comes to operating systems, it's going to depend on your needs. If you mostly use app-based programs, rather than desktop or Web applications, you'll be better off with the iPad Pro. The Microsoft App Store is notoriously limited in its tablet-based offerings. However, if you don't use apps for business that often, and you find you need web-based applications or desktop applications, definitely go with the Surface Pro 4 since it runs full Windows 10.